co-ordinate your project and deal with trades people with confidence. 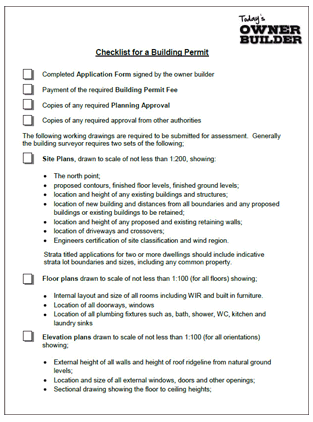 Download FREE checklists and forms to assist you with the approval procedure and organisation of your project. Welcome to Today’s Owner Builder. Congratulations you have taken the first steps towards becoming an owner builder. For those who are still just thinking about it, we hope this website will assist you in making your decision. 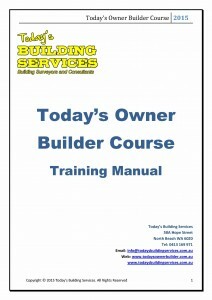 Today’s Owner Builder is a subsidiary of Today’s Building Services Pty Ltd, a Western Australian company that provides building certification, advice and training to the building industry. The decision to build your own home can be hard for some people as it will be the biggest investment of their life, however, it can be an exciting experience and you will get a great deal of satisfaction when you stand back and look at the finished product and know that you made it happen. There are several reasons why people want to be an owner builder. Some people enjoy getting their hands dirty taking on several aspects of the work themselves. Others just want the satisfaction of being involved in the administration and co-ordination process, but in most cases the main reason is to try to save money. 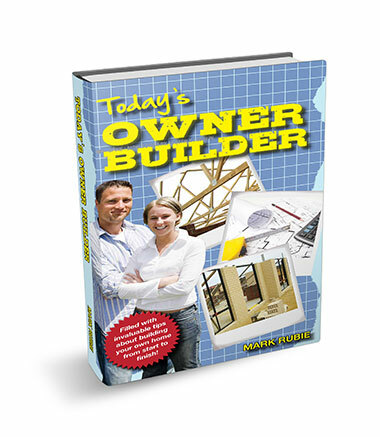 The Today’s Owner Builder book is a useful guide that will assist you in understanding the process of building a home and hopefully save you a great deal of money. It will make you aware of some of the pitfalls that need to be avoided. It is full of useful tips that will ensure your project is completed on schedule and within your budget. Click here to view the first chapter of the book. Click here to download newsletters, fact sheets and forms. This website proudly sponsored by the following companies. Click on the logos below to view their websites.